I know you; your past; your future. 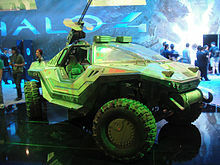 ^ Halo Legends and Halo Waypoint Announced at Comic-Con. Xbox.com. July 23, 2009. ^ What is the Halo? ^ 5.0 5.1 Longdale, Holly. Game Worlds in Written Words. [2006-09-02]. ^ 6.0 6.1 Greene, Marty. First Strike Author Eric Nylund Q&A. [2006-09-02]. ^ Klepek, Patrick. Halo novel cracks bestseller. 2003-05-05 [2006-09-02]. （原始内容存档于2005年4月26日）. ^ Halo: First Strike by Eric Nylund. [2006-09-02]. ^ The Next Halo Novel: Ghosts of Onyx. 2006-08-29 [2006-09-02]. （原始内容存档于2006年10月19日）. ^ Farrell, Nick. Halo movie canned. The Inquirer. 2007-10-09 [2008-05-30] （英语）. ^ Robinson, Andy. Q&A: MS "already in talks" to continue Halo film. Computer and Video Games. 2007-10-29 [2007-10-30]. （原始内容存档于2012-06-30） （英语）. ^ Chen, David. Confirmed: Director Neill Blomkamp Would Probably Not Do a Halo Film, Even If Offered One. /Film. 2009-07-24 [2009-07-24] （英语）. ^ Neill Blomkamp; Peter Jackson. Halo Movie Interview – SDCC 09: Will Halo Still Happen?. IGN. 2009-07-27 [2009-07-27] （英语）. ^ SHOWTIME STILL DEVELOPING HALO TV SERIES. IGN. 2015-08-11 （英语）. ^ Arslan Tufail. Halo TV Series is Still in Production, 343 Industries Confirms. segmentnext.com. 2016-07-05 （英语）. ^ Spielberg's Halo TV Series Starts Filming This Fall. Screen Rant. 2018-03-01 [2018-03-01] （美国英语）.